So, my sister-in-law sent me a link to a cool website called themommiesunited.com . They have some really cool things on it, and one i love is the disposable potty seat. I have seen potty seats that you can buy, but they are not disposable. Definitly worth buying!!!! Tyson and I took the kids roller skating with our friends the Clarkes. WOW....i don't think we'll go again for a couple years! it was really hard. Nash couldn't stay up unless he was on the carpet. Mya actually did a little better than Nash. They both loved it, but Nash got more frustrated than Mya. She loved it and kept wanting to go around and around. We had fun, but we don't think we'll go again until the kids are a bit older. Mine and Tyson's backs are sore from holding the kids up. And I'm shocked we left there without anybody breaking their wrists! Sorry, this one is really dark. But this is Tyson and Nash taking a wipe-out!! We have been swimming alot lately. My kids are quite the little fish. Mya loves loves to "crawl" the wall of the pool the whole time, and Nash does cannon balls into the deepend. He is swimming so good. He learned how to dive to the bottom of the deep end and get the diving stick and come back up, and swim to the side all by himself and with not floaties or anything!! He did awesome!!!! Mya loves babies. My friend was there with us swimming with her new baby, and Mya wouldn't leave her alone. She thinks baby Aidrian needs her passy ALL THE TIME!! We went to Centenial Olympic park for fireworks. It was suc ha good show. Here's Mya while we were looking for a place to sit. Here's me again on the tube. I know it looks like I shouldn't be screaming....but we were going so fast and we just did a big jump thingie. Mya fell asleep like this after a big day of swimming. Poor girl was so worn out. I bought the kids this little pool for my parents backyard. they love it!! yea!!!! So, my sister-in-law emailed me these pictures from the lake last weekend. There are only 2, but i guess that's better than none. The first is of Nash and my nephew Nico. 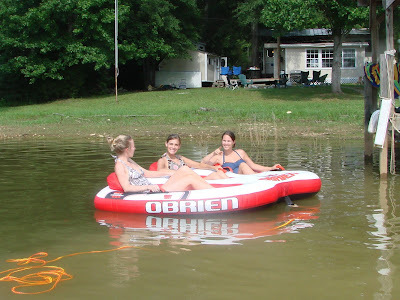 And the bottom one is of Mandy (sister-in-laws friend), me and my sister-in-law Shanna getting ready to go tubing!!! Tyson, the kids and I are down here in Atlanta! Yea. We are going to be here for a few weeks, and I can't download any of my pictures. I know...totally annoying. I have the funnest pictures too. So i'll just give a recap of our time here so far. Our 4th of July weekend was a blast. We went to the Peachtree City parade, which was so fun and long. The kids got SOOO much candy and balls and frisbees. Then we spent the rest of the afternoon at my brothers girlfriends house swimming. Mya was stuck by Sarah's side the whole time, and nash was learning how to do cannon balls by her brother. He can totally swim in the deep end of the pool now with no floaties! He did awesome. Then we headed into Atlanta to Centenial Olympic Park for fireworks. It was the best show i've ever seen. Mya was scared....she thought the fireworks were going to get her...so she hid behind our backs most of the time. 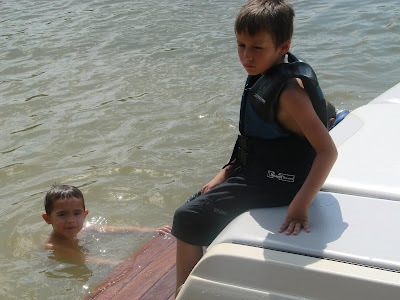 Then on Sat, we headed to Lake Wedowee to my parents place on the lake for my nephews b-day. We went tubing, land locking, and wakeboarding. I took Mya on the tube and she loved it. Nash went on also...and boy did he LOVE it. He kept wanting to go faster and faster. He's such a dare devil...(unlike Mya and me). So that was our weekend. It was so much fun. Also, on thursday... me, nash, and a friend of mine with her kids went to American Adventures. It's a theme park for kids under 10 years old. Nash didn't want to leave. His favorite was the roller coaster and the twistee cups. Hopefully I can figure out how to get my pictures downloaded so you can all see our fun pictures!